God the Joy of My Life. God the Joy of My Life. The Diary of Blessed Teresa of the Andes, translated and with a biography by Michael D. Griffin, ocd, Teresian Charism Press, 2131 Lincoln Road Northeast, Washington, DC 20002 (USA),1989, 246 pages. English translation of Juanita's Diary with a long biographical introduction by Fr. Griffin. Letters of Saint Teresa of Jesus of the Andes, translated by Michael D. Griffin, ocd, Teresian Charism Press, Holy Hill, 1525 Carmel Road, Hubertus, WI 53033 (USA), 1994. English translation of Teresa's Letters. There is also an interesting graphological analysis of Teresa's writing by Sister Kay Elmer. 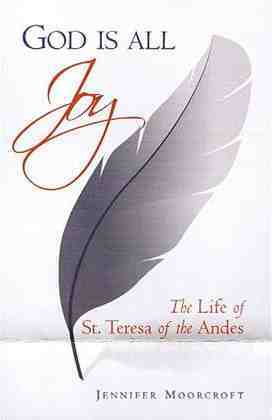 God is All Joy : The Life of St. Teresa of the Andes by Jennifer Moorcroft, ICS Publications, Washington, 2009, 163 pages. The first biography of Teresa in English. A New Hymn to God, compiled by Michael D. Griffin, ocd, Teresian Charism Press, Holy Hill, 1525 Carmel Road, Hubertus, WI 53033 (USA), 1993, 107 pages. Various texts about Teresa: homily of John Paul II for Teresa's canonization, homily of cardinal Sodano for the thanksgiving mass after canonization, meditation on the texts of the mass in honor of Teresa. Testimonies to Blessed Teresa of the Andes, compiled by Michael D. Griffin, ocd, Teresian Charism Press, Holy Hill, 1525 Carmel Road, Hubertus, WI 53033 (USA), 1991, 217 pages. This book includes the necrological letter written in 1920, after Teresa's death by Mother Angelica Teresa, prioress of the carmel of Los Andes), testimonies by Lucho about his sister at the beatification process, the English translation of Así pensaba Teresa de Los Andes of Fr. Marino Purroy, various prayers of Juanita taken from her Diary, the Relatio written by Fr. Valentino Macca, ocd, for the beatification process and a text from the Carmelite nuns of Los Andes.